When I opened the package I let out a BIG squeal! I’ve been wanting to get a Galaxy for a while! I’ve been using my Samsung Galaxy Tablet for a few weeks now and boy is it great! My entire family loves this device – it’s so great for watching videos or browsing the net. It’s is very easy to use, the interface is intuitive and very user friendly. Getting around from app to app is very easy and the screen is so responsive to the touch. One thing I’m pretty blown away by is the video quality, it’s so crystal clear and paired with the Verizon data it’s fast and smooth for video streaming! Perfect for watching my favorite programs when the girls are tucked in to bed. The tablet is the perfect size too, it’s not too big but not so small that the screen makes me have to squint to use it. For me – I use it for some me time at the end of the day. The kids are in bed and it’s quiet so I crawl into bed and catch up on episodes of True Blood. It’s my little slice of heaven at the end of the day! For hubby – He uses it to do quick research and surf YouTube videos. and of course, for the kids – There are tons of games in the Android market, I mean TONS!!! I downloaded a Mickey Mouse game and a My Little Pony puzzle game for Pinky. It’s great for when you need a quick distraction when your in a restaurant or need to get something done in the house. There are also some very good educational apps for her to learn her basics before she heads off to preschool! 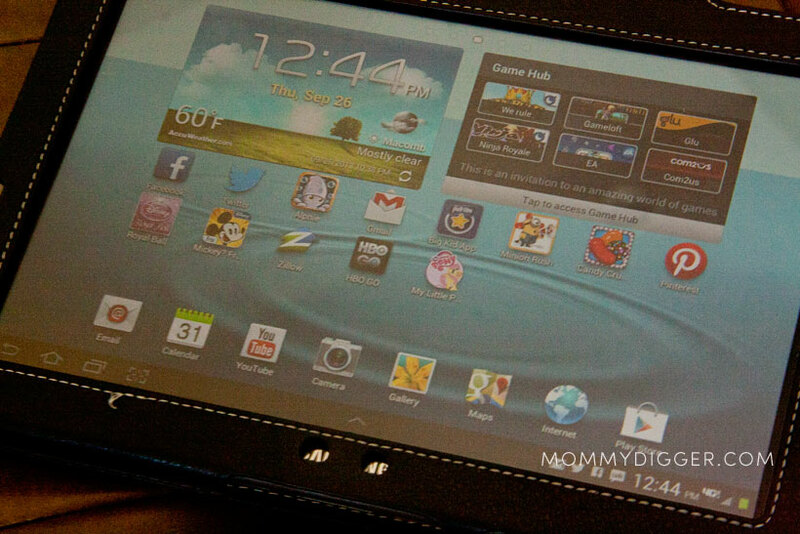 We are loving our Galaxy Tablet and it’s really going to get put to the use on our vacation in a few weeks. We’ll be in the car for hours and it’s going to come in VERY handy entertaining the girls with movies and games for Pinky. The Verizon data has been super fast so it will be perfect for watching videos on the loooonnnggg car ride! Stay tuned for more of my thoughts on the Galaxy Tablet and how it makes our road trip with toddlers go smoother! This tablet looks very nice – I am looking to buy a tablet as a Christmas present for my grandkids and want to make sure it is easy for them to use. You should check this one out, my daughter is three and she uses it on her own and knows how to get to all her apps. It’s great for kids, plus they can watch movies on it on long trips!